Zapproved shares their healthcare industry experience and recommendations for handling the daunting challenges of ediscovery. In NuVasive, Inc. v. Madsen Med., Inc., the court sanctioned a medical device company that issued a legal hold but failed to take affirmative steps to implement it, follow up with custodians on their compliance with the terms of the hold, or ensure that the hold covered all relevant data. In Small v. Univ. Med. Ctr. of S. Nev., a court-appointed special master recommended that the court enter a default judgment and other sanctions in a wage and hour class action against a university hospital. The hospital failed to preserve data, including text messages, on employees’ company-issued and personal mobile devices. Litigation and government investigations involving health care entities are complicated, with additional burdens over and above typical legal matters. Here are some suggestions from years of working with hospitals and health insurers on how to attain a clean bill of ediscovery health. 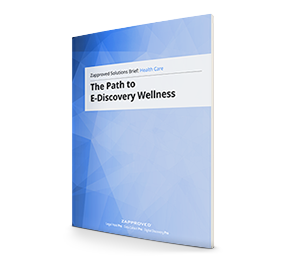 Read the Zapproved Solution Brief for the Health Care Industry for insights about how to improve their approach to ediscovery and regulatory compliance. We’re here to help. Call us toll-free at (888) 806-6750 or contact us.